(This funding drive is closed - and THANK YOU! 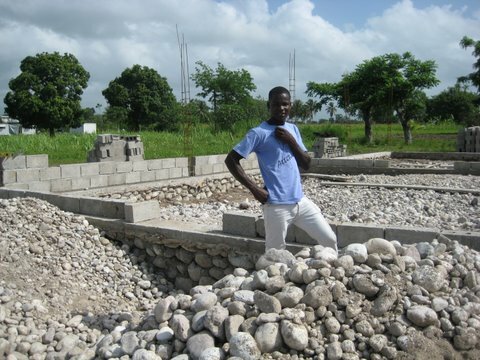 Quietly, over the past several months, Project Rennwish and Pwoje Espwa entered into a partnership to build a multi-faceted technical training school for the young adults within Pwoje Espwa and the local community. As you read this, we have already begun the site preparation, road work - and are well on our way into the actual construction of the first two buildings/classrooms (see the photo gallery below). The premise and goal is to provide tuition-free training school for adolescents with specific skills: Best practices in various trades with marketable skills in the Haitian economy. The curriculums include technology, budget management and entrepreneurial training. Students will graduate with practical knowledge enabling them to become independent, find jobs, start their own businesses and generally contribute to the improvement of the Haitian economy. The school will commence with classes in several individual vocations. Each student will enroll for his/her desired trade. A series of core courses, to include budget management and entrepreneurship, will be required for every student. After three years in the program, students will graduate with a certificate in their area of expertise. Our "success" is not measured by what we "operate" or "own" (we do neither)- but rather, how our investments have changed a single child, a group of children, a family - or again - in this case - an entire generation of children in both the short and long term. It is our sincere hope that our "projects" outlast and persevere far beyond our mortal lives. We demand integrity, moral ethics and irreproachable principles from our partners with whom we undertake partnership programs. In this case, we have been assured multiple times by Pwoje Espwa that each and every Technical School will be used as building block to vocational training of Haiti's' youths. Within an economically troubled country with limited opportunities for employment, adolescents need proven abilities in trade and skills in entrepreneurship in order to increase their chances of financial independence and stability. 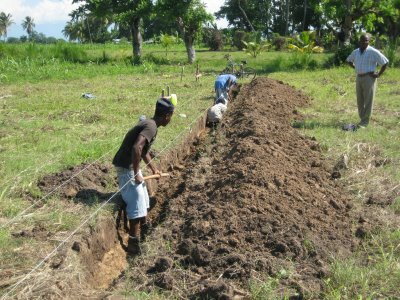 With an unemployment rate of over eighty percent and with sixty-five percent of Haitians living at horrific levels of poverty - Haitians constantly struggle to support themselves, their families, and oftentimes their extended families. With a training school, Project Rennwish & Pwoje Espwa aim to expand their roles in the community and address these head-on in a measurable and sustainable way. Typically, challenging students to think entrepreneurially and plan for the future is not part of the Haitian academic curriculum. 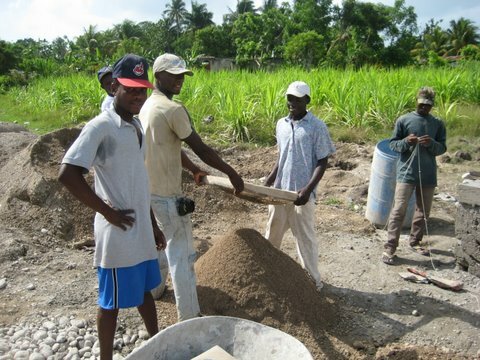 With the vocational training school, we are giving Haitian youths the chance to assert control over their lives and methodically plan and save for their future and their families. The campus at Pwoje Espwa is an ideal setting for this, as younger children can watch older siblings and friends as they study at the vocational school, perhaps inspiring them to think forward to a career themselves. "What do you mean I have to go to Technical School someday?" When complete, the training facilities will include thirteen buildings in entirety. Ten of the buildings will be designated for the various trades being taught, and the other three will be for alternate purposes: a restroom facility, a business classroom, and an administrative office. All buildings will be free standing, each sized according to the need of the trade. In the case of a few trades (metalworking, for example), indoor work areas, as well as covered outdoor facilities will be necessary. The common teaching space will allow students to learn business management and entrepreneurial skills. 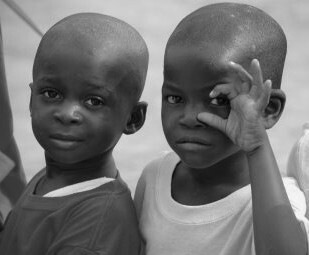 We firmly believe it gives youngsters outside Haiti a rare and culturally rich opportunity to understand the difficulties of living in an impoverished world - a world they may have never knew existed. The vast majority of support for our projects come from private individuals and families. We are grateful to all and anyone who takes a minute to give what they can - whether a small amount or recurring large contributions. All are equally appreciated. 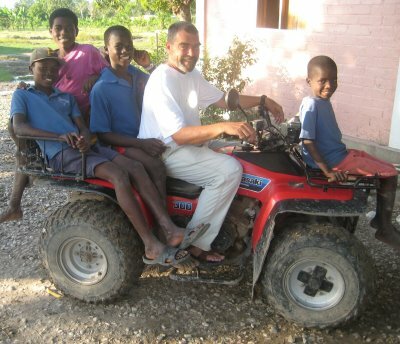 Father Marc Boisvert - and a few "hitchhikers"
Pwoje Espwa (Project Hope), founded in 1998 by Father Marc Boisvert, O.M.I., is dedicated to alleviating the devastating effects of poverty on children in southern Haiti. 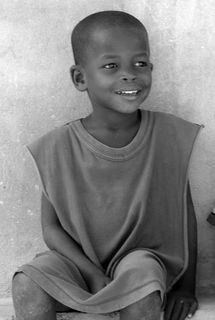 Today, Pwoje Espwa provides safe housing, nutritious meals, education, and health care for almost 700 resident children. 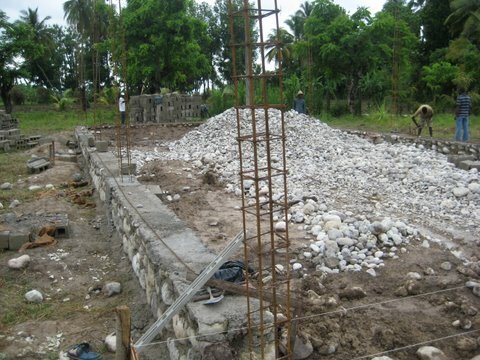 Father Marc's first mission in Haiti was at a small parish in the village of Camp Perrin. As he worked with the people, he was appalled by the plight of the children coming to him, desperate for help. They were homeless, hungry, and in need of basic health care and education. The first home for Pwoje Espwa was a one room house at Camp Perrin with six boys in residence. Father Marc was convinced by the young men working with him that the need was even greater in the nearby city of Les Cayes. The move was made, again to a small home, but as the number of children in need continued to grow, the program needed to move to a building in the city, the original site of a seminary for 75 residents. Again, the site became inadequate to care for all the children coming for help. 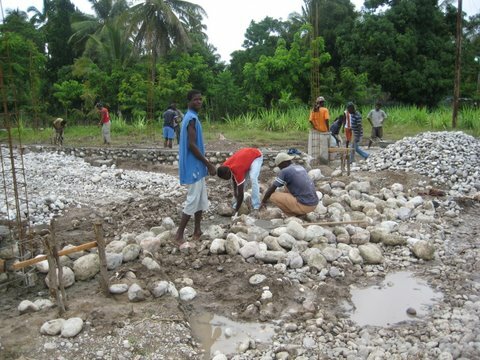 In 2002, the organization was able to purchase 140 acres of fertile land, located fifteen minutes west of Les Cayes. Today, Vilaj Espwa serves over 700 resident children and adolescents ages 3 to 24. 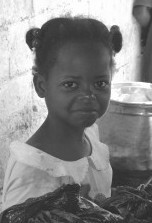 The children live in small dormitory settings, with 16 to 20 kids per house parent. Extensive construction will be taking place for years to come as Pwoje Espwa develops and improves the infrastructure at Vilaj Espwa. 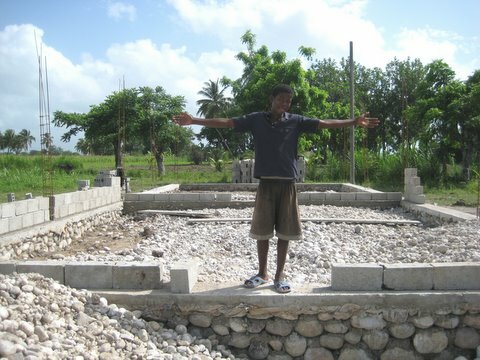 Many of the young men are involved in the construction process, learning valuable trade skills along the way. The eventual goal is to create a village that is completely sustainable and environmentally sound, all while providing the children the tools necessary to succeed in a number of disciplines. 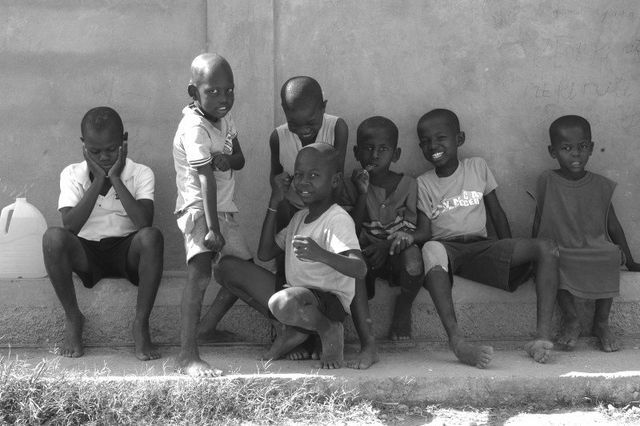 As a direct result of the work of Pwoje Espwa, over 2,000 children go to school everyday. This is accomplished by operating three schools in three different cities, and providing scholarships to children and adolescents in need. Vilaj Espwa, also known as Castel Pere, has a primary and secondary school that educates all of Pwoje Espwa's younger residents, and provides free education for over 200 children from the surrounding community. 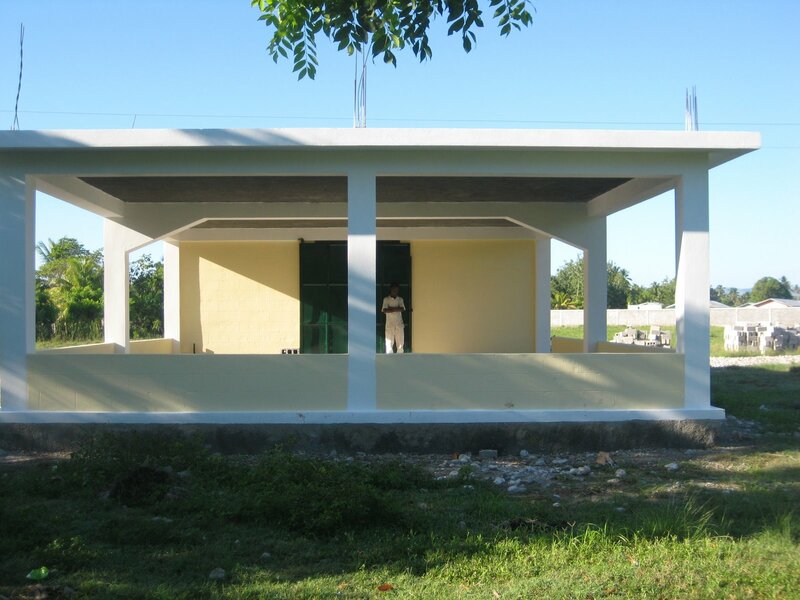 Last year, the school had the highest success rating of any school in Les Cayes, which is indicative of the organization's commitment to education. About four hours west of Les Cayes, is a small town by the name of Tiburon. 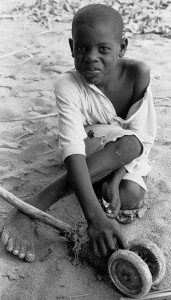 Due to the inability for most children in Tiburon to afford education, in 2003, Pwoje Espwa established a school there. 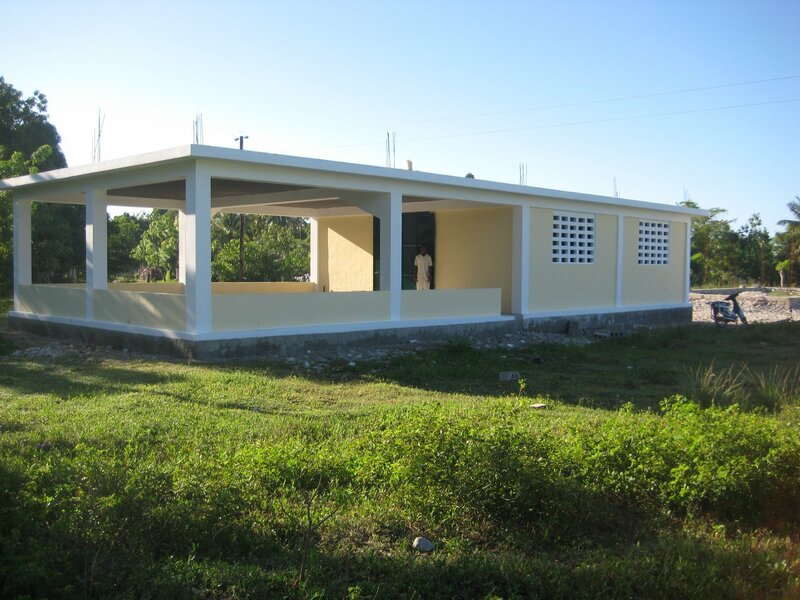 The initial location of the school became too small to encompass the growing needs of the community, so in order to address the situation and continue to serve the children; Pwoje Espwa built a larger facility. Camp Perrin is the site of the third school operated by Pwoje Espwa. 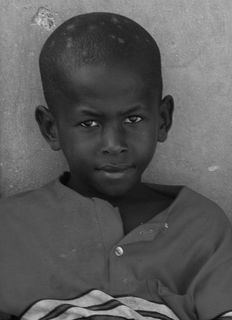 Three hundred eighty students who would otherwise be unable to receive an education, are now attending school everyday. 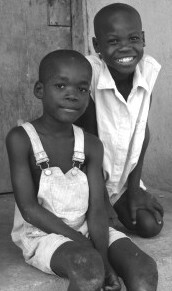 Every year, Pwoje Espwa provides scholarships for children in the surrounding communities to go to school. Last year, we funded 262 children's educational expenses, and next year it will be more. 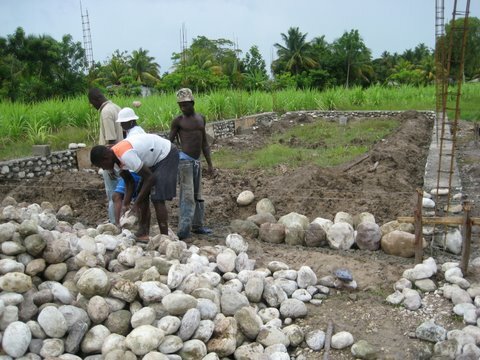 Seated on over one hundred forty acres of land, Castel Pere's agricultural amenities will one day become self sustaining and able to profitably provide for the children of Pwoje Espwa. Currently our farmers are caring for livestock and crops. Providing over three thousand meals a day for our children, as well as for neighbors in the community surrounding Vilaj Espwa, is a large and costly task. With the help of our agriculturalists, we are able to reduce the purchasing costs of animal protein and vegetables by utilizing what we grow on our land. Along with mangos, guavas, papaya and breadfruit, we also harvest various vegetables. Being that the Caribbean allows for two harvesting seasons, we are able to diversify our vegetable crops allowing for constant multiplicity in consumption. Corn, onions, tomatoes, beans, egg plant, potatoes, carrots, okra, and cucumber are just a few of the assortment of fresh vegetables we yield. Currently we are unable to supply the entire quantity of vegetables required for servicing our population due to a lack of funding. Our goal is to produce, consume, and vend our crops, ultimately reaching the objective of obtaining a self sustaining project. Our livestock include over fifty pigs and thirty head of cattle. We also raise rabbits and care for two horses. On average, we slaughter a pig and a cow every couple weeks in order to supplement animal protein into our children's diets. We also utilize our cattle to assist in the plowing of our crops. Our pigs are fed the bi-products of our corn that we harvest, as well as other various crops in order to maintain a cost efficient, environmentally friendly site. On the one hundred forty acres of Castel Pere a small health clinic is sited in the main village. This clinic has proven to be vital in the health aid of the close to seven hundred children Espwa cares for, their families, and the local villagers. The small three roomed facility contains an office, large reception/ examination room, and a private room with a bed. Being that effective emergency health aid is so difficult to come by in country, let along regular well visits, our health resource is crucial. When the normal physical, mental, nutritional and social development of a child is delayed or severely impaired, life long poverty and hardship often result. We believe that a healthy child has a better chance of becoming a responsible, productive adult. Thus the major objective of our medical facility is to insure that the basic health, nutritional and developmental needs of our children as well as those of our neighbors are met. Each resident has completed an initial examination including assessment for general physical health status, height/weight, vision and hearing exams, testing for anemia as well as TB screening, if needed. The children are also given initial immunizations, and it is anticipated that they will continue to receive annual immunizations as required. The acute care infirmary is used for observation and treatment of resident children. Dehydration, pneumonia and sickle cell crisis are the most common causes that historically have necessitated hospitalizations for our children. Based on the current population, there are approximately 75 days annually of inpatient care. We believe that Vilaj Espwa is a project that will one day become a template for other organizations with similar missions who work with the children of Haiti. The goal of providing future adult Haitians life long skills based on integrated personal, educational and vocational development is a beacon of hope for the future of the country.